Pastor Rick Warren is mostly criticized because he is mostly misunderstood! That is my conclusion. People who criticize him do not know him. You will appreciate his methods if you will only see his motives. Even if he is the 'most dangerous pastor in the world', I like him a lot. He inspires me to live my life to the fullest for the glory of God! If you go to YouTube or Google, you will find these titles: "Rick Warren: The World's most Dangerous Pastor." "Rick Warren Exposed". "Church of Tares". "Rick Warren Controversy". 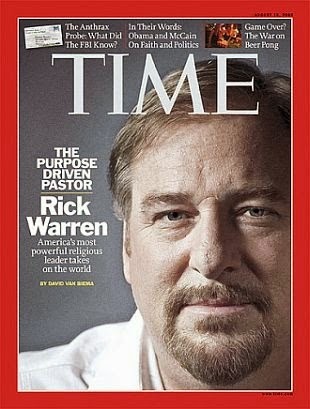 "Rick Warren's Religion of the Anti-Christ", Rick Warren False Prophet, etc. Again, he is extremely criticized because he is greatly misunderstood. So if Rick Warren is a false teacher along with Joel Osteen, T.D Jakes, Benny Hinn, Morris Cerullo, Joseph Prince, John MacArthur, John Piper, Paul Washer, Billy Graham, John Maxwell, Chuck Swindoll, Joyce Myer and host of other famous ministers, then who is the true prophet and teacher in this generation? Everyone is criticizing somebody because somebody does not share everyone's view! That is the problem. Just because they are famous preachers or pastors of mega-churches does not mean they are false teachers. Just because your church is small does not mean your doctrine is correct or just because you are unknown does not mean you are always right. Just because one preacher speaks in tongues doesn't mean he is a false prophet and just because someone does not allow women to preach does not make him a false teacher. Just because others do not agree with your interpretation does not mean they are false teacher or wolves in sheep clothing. No one is perfect. Everyone say all kinds of stupid things, including you. I read Warren's books and listen to almost all of his sermons on YouTube. I found out that he does things because of what he believes. Lots of his critics, which by the way are fellow Christians misunderstood Rick's methodology. For example, rick preached holiness and repentance without using the terms. For Christians, who already knows the theological terms criticized him badly for this. Rick's target when he started his church is to the unchurched Californians. His method and style are created to reach his target. The reason Rick Warren does what he does is because people matter to God. Rick believes in eternity-heaven and hell and therefore he wants as many people as possible to be saved and go to heaven. Rick is an evangelist, a missionary and a pastor. In fact, he is a fourth generation pastor. He read most of theological books from the Apostle Paul to the 21st century. He read through Calvin, Luther, Wesley etc. In 2010, he completed reading The Works of Jonathan Edwards, 26 volumes totaling over 16, 000 pages. Rick planted, grow and established one of the fastest growing churches in the world from zero. Saddleback is located in a 120 acres (48.5 hectares) campus in Lake Forest California. Rick baptized over 30, 000 new believers in the last last 10 years of Saddleback. He literally sent 15, 000 of his members to 195 countries in the world fulfilling his P.E.A.C.E Plan. Peace is an acronym for Plant churches that promote reconciliation; Equip servant leaders; Assist the poor; Care for the sick; and Educate the next generation. He also trained 400,000 pastors in 164 countries and does humanitarian works as well. His book Purpose Driven Life is the best selling hardback in American history and is the most translated book in the world, except the Bible; it's translated in 137 languages. Warren live a simple lifestyle. His book brought tens of millions of dollars but he didn't change his lifestyle. He paid back the salary paid for him by the church in 25 years, he stopped getting salary from his church, he drives an old car and lives in an old house. He is also a reversed tither. He lives on 9% of his income and give away 91%. When I was in the Bible school, I read famous preachers who lost their integrity due to moral failure. The lifestyle of many TV preachers today are not a good example of the kind of life Jesus modeled. Many are not only fallen morally but got caught up with materialism and prosperity. Thus, when I heard about Warren's simple lifestyle despite his enormous success, I said, "finally there is a pastor who models simplicity in this prosperity driven world." Yet, despite his simple lifestyle, what he did and what he is doing to advance God's kingdom, Warren is still severely criticized. Why criticized what God is blessing and using to bring people to the Lord? Why can we pastors and ministers set aside our own "correct" interpretation of the Bible and "correct" dogma" and unite to reach the lost? Just because others don't share your own view does not mean they are heretical. If people are being saved by the faith alone through Jesus Christ, lives are being transformed, growing in Christlike maturity and reaching out to their community and the world, why do we spend our energy beating up one another because of their methods and ministry style? God is using Rick because his main purpose is to fulfill the 5 purposes of the church: worship, discipleship, fellowship, evangelism and ministry. Within the last 10 years, his focus was on the PEACE Plan. Peace is an acronym for Plant churches that promote reconciliation; Equip servant leaders; Assist the poor; Care for the sick; and Educate the next generation.